Thank you 'Sumit' for giving me this Award. 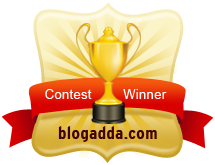 This is my first blogging award and I am honoured (Taliyan). Kaustubh is a good friend and to him I give this award for his Humorous writing style. Ayon is my ex-boss and now a blogging pal- I give him this award for his tips on Management and for his punch in the gut fiction writing. and to Amit who became a pal when I started blogging - I give this award to him for writing from the heart. Each of these people have their unique writing styles. Folks do go and have a look at their fabulous blogs. OMG- Aquarius-what a wonderful way to end a somewhat tiring day! !Yes,I was feeling totally tired out today,and decided to log on and blog a bit before going off to the Land of Nod! :)Thanks a ton for the award:)And,of course- congrats to you for getting the award! !U deserve it!Ohh,yes,I'm sure that inspires u to post more regularly! hey Amit...ur most welcome :) yes I hope so too that I post more regularly. And thank for mentioning me...I am humbled and honoured!!! Heyyy,Aquarius-I never expected that you'd take a siesta after giving the awards,thinking that people'd be busy at our blogs..haha!! :)Next post,pls. Good one...no siesta man....just that my laptop is conked off : Will put up something real fast.